Rikhi, along with his parents Mirja and Shankar Datt, have lived their lives around food, but not just any food. Their specialty is authentic Indian cuisine, and they love to share it. While their journey as a family has led them through family restaurants, glamorous dinners at Indian embassies and countless dinner parties in their homes, their newest offering is connected to Child Haven International. Child Haven International is a not for profit charity that was founded in 1985 by Bonnie and Fred Cappuccino. The organization has opened nine children’s homes across India, in Bangladesh, in Nepal and in Tibet. Inspired by the ideals of Mahatma Gandhi, this non-secular charity hosts fund-raising dinners all across Canada throughout the year. The proceeds are used to assist children and women in developing countries that are in need of food, education, healthcare, shelter and clothing, as well as emotional and moral support. “A friend of ours was volunteering with Child Haven,” reflects Rikhi, “and we decided to make something for the fund-raising dinner. We went, saw the dinner, the people—they had a mishmash of great food, but not all authentic Indian. We said, ‘We’ll make everything!’” Now, four years later, they are preparing all of the food for Child Haven’s annual fund-raising dinner in Courtenay, which takes place October 19. Child Haven’s work reaches children in India as well as other countries, and the Datt family feels this is a cause close to their hearts, so they happily put in hours of time shopping for groceries and preparing the food for the grand dinner as a way to support the charity. “Pops” aka Shankar, now in his 80s, is a spunky man with bright eyes who left India when he was 18. He lived and worked in Holland and England, then returned to India for five years before heading to Canada in the 1960s, where he began working at the Indian Embassy in Ottawa. Here, he met his wife Mirja Blom. After living in Ottawa for a few years they moved to New York City to work at the Indian Embassy there. In the 1960s Shankar oversaw a dinner for Queen Elizabeth during a royal visit to Ottawa. At that point he was doing more supervising the kitchen than cooking. He remembers the RCMP—more than 4,000 of them lining the drive for the Queen—and shares how it made an impression on him. “I had a good life,” he says. Shankar always knew he wanted to own a restaurant, so in the 1970s he moved to Nanaimo, BC. He had heard there were many Indian families on the West Coast. In 1978 he opened his first restaurant, called—Datt Place—in Departure Bay. 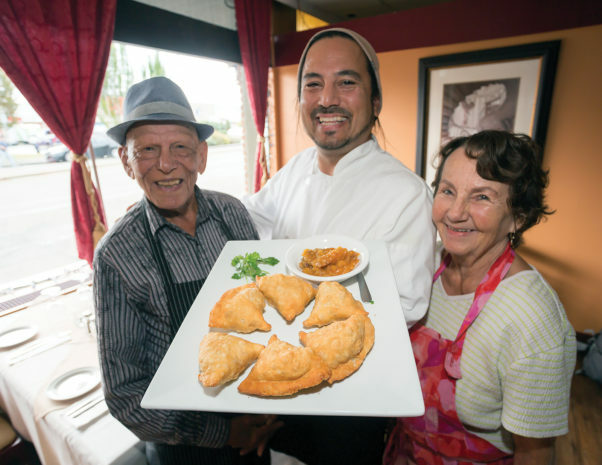 The Datt family spent 40 years in Nanaimo during which time the entire family (which included Mirja, Shankar and their three children Arun, Astrid and Rikhi) helped with the restaurants. Shankar also bought and sold real estate and worked at the local mill while living in Nanaimo to support his restaurant dream. In 2009, Rikhi moved to the Comox Valley; his parents followed about a year later. In 2011 they opened a small Indian restaurant called Go Mango, which was open for a year. They have been cooking for Child Haven International since 2012. This year’s dinner will be held in October at the Florence Filberg Centre in Courtenay, and will seat 200 people. It is an all vegetarian Indian feast that typically takes the Datt family four days to prepare. They begin by traveling to Vancouver, to the Indian markets, to buy all the groceries, which takes an entire day. They appreciate the quality and cost effective quantity of the spices and vegetables they are able to get in the city. Then they begin to prepare the food. And they’re making 500 of them! “She cooks for luxury,” Shankar says with a laugh. “I cook for survival.” This is obviously a joke, as rumor has it that Shankar will prepare fabulous meals just for friends—any time—simply because he loves it. In fact, the family has company coming for dinner tonight and the intoxicating smell of warm spices envelopes me as I enter their home. I am treated to a warm samosa with their infamous mango chutney, followed by gulab jamun, which is a little cake, first fried then soaked in syrup. It is very sweet and melts in my mouth. It is a long process to create these treats, they explain. “You have to make them without seams,” says Rikhi, mimicking the motion of rolling the dough into a little ball. It is a very tricky process to make gulab jamun, he says, but his mother is the best at it. She laughs, and asks how I like it. “It is very good, and very sweet,” I say. He explains that one can create four or five different tastes out of the same spices. “That is the way spices are all about,” he says, smiling. The cost of the food for the Child Haven International fund-raising dinner is covered by the charity, but all the time spent cooking and preparing is donated, and, as Rikhi says “we do everything.” Much of the food is cooked on location at the Florence Filberg Centre, with an army of helpers who also volunteer with Child Haven. Some items are cooked at Yiamas, a Greek restaurant in Courtenay that graciously opens its kitchen for the preparation of the dinner. Yiamas also provides the linens and table cloths they use for the dinner. Plates Eatery donates the use of all the pots and plates, which they drop off and pick up, and Sieffert’s Farm donates some of the produce that is used in the food dishes. Although the Datt family heads the process, they acknowledge that is a close knit community, all pulling together for the cause. While the dinner will vary a little from year to year, it will always include the classic vegetarian Indian favorites such as samosas, paneer, pakoras, dahl, curry and poppadoms. If the dinner is anything like the samosa with mango chutney, and the gulab jamun I have just been given, then our community is in for a treat. As a parting gift I am given a jar of their “Go Mango” chutney—a signature family recipe that has been carried through the years. “People have always wanted to buy it,” says Rikhi, “but we’ve never really bottled it.” They finally started to bottle it when they owned Go Mango due to the constant requests for it.